New Revolutionary Product! Developed after 40 years of research on saliva chemistry at Stony Brook School of Dental Medicine in New York, BasicBites™ helps maintain the proper oral pH levels necessary for good oral health and the prevention of halitosis. BasicBites™ helps neutralize the acidic pH environment that occurs in people who experience dry mouth conditions, which in turn helps prevent the overgrowth of halitosis causing bacteria. 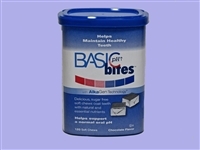 BasicBites™also neutralizes the acids that are responsible for cavities which are produced by tooth decay causing bacteria on the teeth. Another benefit of BasicBites™ is its ability to neutralize the acidic effects commonly caused by "sports" or "power" drinks. These drinks are very acidic and are known to produce pitting in the teeth, especially in children. The saliva-mimicking technology of this product consists of two primary ingredients, arginine carbonate and calcium carbonate which are the active ingredients in BasicBites™. Arginine is an amino acid naturally found in saliva and many foods.